The first appearance of this award-winning writer's work since the 1940s, this collection, which includes an introduction by John Ashbery, restores Joan Murray's striking poetry to its originally intended form. 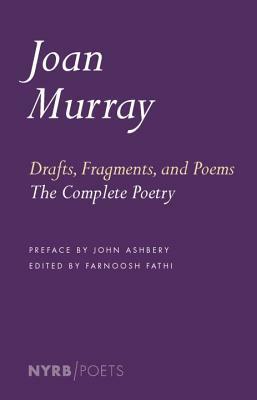 Though John Ashbery hailed Joan Murray as a key influence on his work, Murray’s sole collection, Poems, published after her death at the early age of twenty-four and selected by W. H. Auden for inclusion in the Yale Series of Younger Poets, has been almost entirely unavailable for the better part of half a century. Poems was put together by Grant Code, a close friend of Murray’s mother, and when Murray’s papers, long thought to be lost, reappeared in 2013, it became clear that Code had exercised a heavy editorial hand. This new collection, edited by Farnoosh Fathi from Murray’s original manuscripts, restores Murray’s raw lyricism and visionary lines, while also including a good deal of previously unpublished work, as well as a selection of her exuberant letters. Joan Murray (1917–1942) was born during an air raid in London. She was the daughter of Stanley Webster Murray, a painter and illustrator, and Florence Margaret Murray, a diseuse. She spent her early years in London, Paris, and Ontario, and lived most of her short life in the United States, where she studied dance and theater, and poetry with W. H. Auden at the New School. She suffered from rheumatic fever as a child, the complications of which led to a chronic heart condition and eventually to her death. John Ashbery (1927-2017) was the author of several books of poetry, including Self-Portrait in a Convex Mirror (1975), which received the Pulitzer Prize for Poetry, the National Book Critics Circle Award, and the National Book Award. His first collection, Some Trees (1956), was selected by W. H. Auden for the Yale Younger Poets Series. He also published art criticism, plays, and a novel. From 1990 until 2008 Ashbery was the Charles P. Stevenson, Jr. Professor of Languages and Literature at Bard College. His most recent collection of poems, Commotion of the Birds, was published in October 2016. Farnoosh Fathi is the author of the poetry collection Great Guns and founder of the Young Artists Language & Devotion Alliance (YALDA). She teaches at the Stanford Pre-Collegiate Summer Institutes and lives in New York. "Her poems are mystical, surreal, funny, and poignant in their playful visions of a future the poet wasn’t to have." —Meghan O'Rourke, Vulture, "9 Books of Poems That Prove 2018 Was a Fantastic Year — at Least for Poetry"